Traveling with kids can be a huge pain, or it can be delightful, depending on proper planning and a good attitude. For sure, traveling with kids can be tiring, but it’s well worth it to make good memories with your family. Pack one bag with the basics. You’ll check this bag. Then pack another bag for the airplane. Source: Family Travel Magazine. Packing properly is a key to summer travel with kids. More great tips ahead! Apps are your best friend when traveling with kids. When we’re at home, sure screen time is limited. But when we’re traveling, apps keeps kids calm and quiet when boredom strikes. Be sure to check out these websites to find the best ones for your child’s interests and age ranges. If you are flying, it is Murphy’s Law that your child WILL have an accident, especially if all your clothes are neatly packed in your checked baggage. Don’t tempt fate. Just go ahead and pack extra clothing in the carry on. 4. 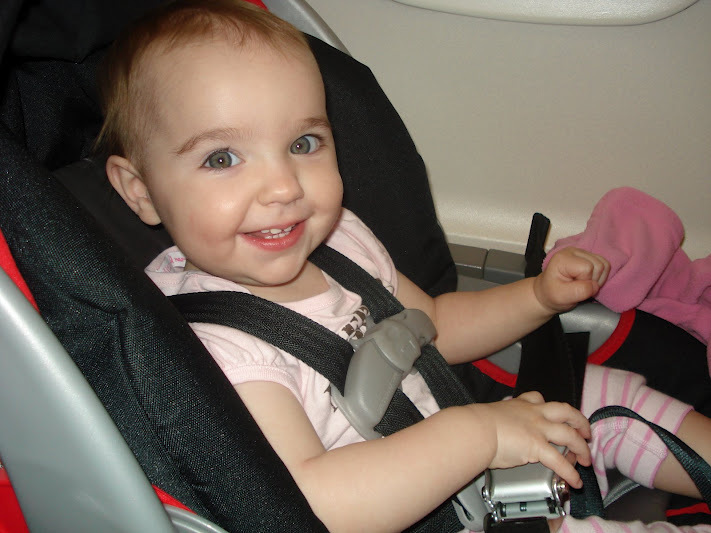 To Car Seat on the Plane or Not to Car Seat on the Plane? That is the Question. When it comes to babies: Okay, sure, safety experts will tell you to bring the car seat. But let’s get real. Airlines don’t require you buy a seat for babies under 2. And frankly, most babies won’t sit in them even if you buy a seat for your baby, so why waste your money? If you happen to have one of those magical babies who falls asleep easily in the car seat and you’re made of money, okay, go ahead. But for the rest of us… Um, I say, don’t bother. It’s usually free to check car seats. When it comes to toddlers: Here’s my opinion, once my daughter turned 2 and we were required to buy her own seat, we brought the car seat on the plane. She was required to sit in the seat during takeoff and landing anyway. For toddlers, their own car seats are way more comfy cozy than an airplane seat. Plus, if they happen to fall asleep on the flight, you’re golden. 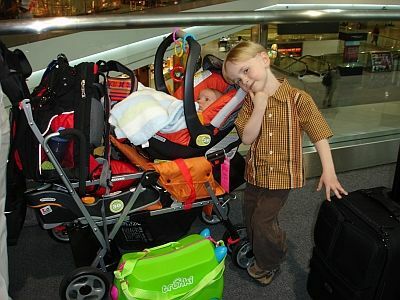 Here’s an extra tip: Buy or borrow a lightweight car seat so you don’t have to drag your super duper heavy car seat through the airport. We had the extra grandparents car seat that we took with us for travel. It was a less expensive seat, much lighter and easier to handle. Airports are a hub of international travel, therefore, potential diseases you wouldn’t normally be exposed to. While I’m generally not in favor of hand sanitizer, a good hand washing usually does the trick, for airline travel, I say use it liberally. Kids stick their hands in their mouths and touch everything. It just makes sense. No matter how much you eat ahead of time, there’s something about being in an airport that makes kids hungry. 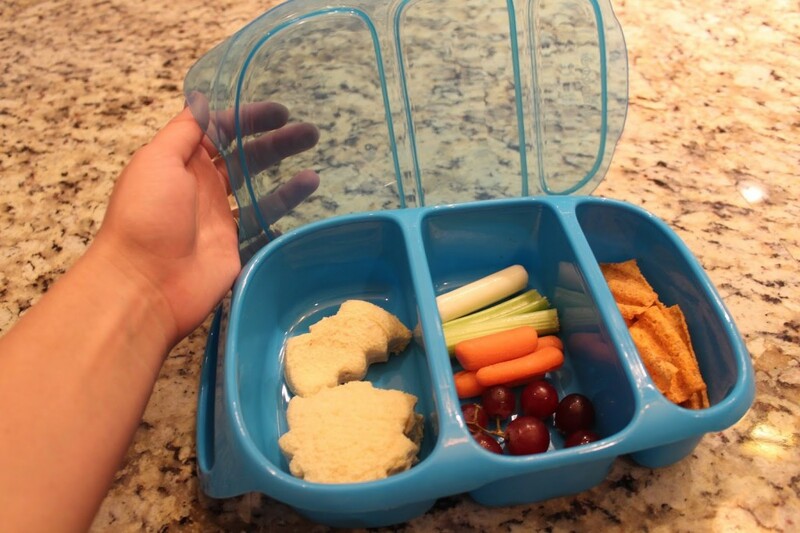 Do yourself a favor and pack a lunchbox of treats ahead of time. It also alleviates boredom. And hey, if they’re eating, they can’t complain, right? Right??? Before you leave, make sure your child is wearing easy on, easy off, shoes. Flip flops are great for airports. Especially for kids who can’t tie their own shoes. While you’re waiting for your flight, walk around the airport. Browse the gift shops (no need to buy anything). Let the kids play with the pay phones — my daughter loves to do this. Don’t break out the snacks and toys in the airport. You’ll need them for the plane. If you’re travelling with a stroller, don’t check it at the curb. Bring it into the airport with you and check it right before you board. If you have toddlers, they will love to have something to push. Aaaand you can put your bags in it! For babies, the benefits are obvious. 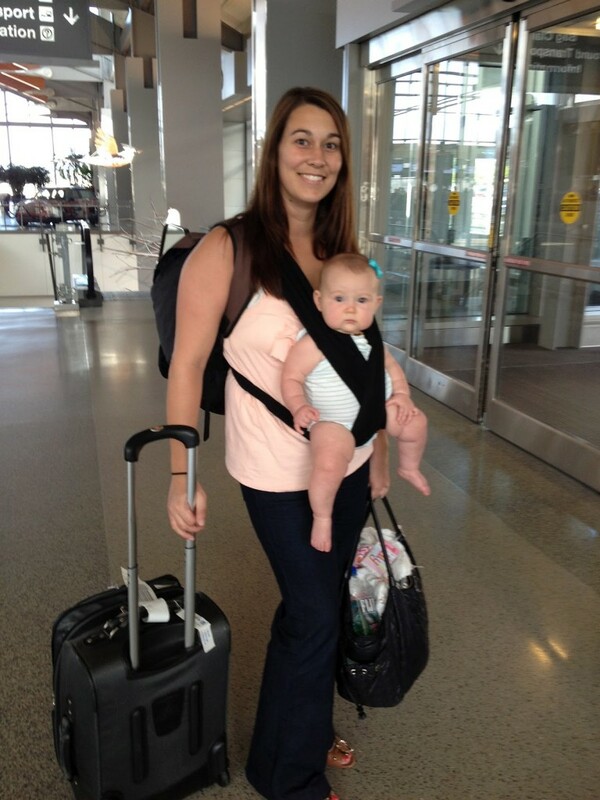 No need to carry the baby and your baggage! Make sure you fill out your tag ahead of time so you are ready to go when it’s time to board. Babywearing is all the rage these days and even if it’s not your bag on typical days, putting your baby in a sling can really make a huge difference in how quickly or easily you travel through an airport. If you don’t own a sling, it’s a safe bet that one of your mom friends has one she’ll be happy to let you borrow. All kids end up needing to pee as soon as you finish sweating through the boarding process and stuffing your carry-ons into that tiny little space above your seat. Avoid this by having them hit the restroom about 15 minutes before you board. Gadgets are great and definitely have their place in car travel — see the apps list above. Use your gadgets liberally during a road trip, but don’t hedge your bets on electronic entertainment for the entire car ride. Personally, I save them for after everything else gets boring, because believe me it all will at some point. You just have to be ready to throw something else at them. I cannot stress the word new enough here. No matter how many coloring books, crayons, markers and Playdough you have in your house, it will be just as boring as they are at home. But if you go to the dollar store and stock up on brand new coloring books, markers, Playdough and word search books, it’s like a magical, fairyland Christmas… for the first hour. Hey, don’t spend too much on this stuff, but do buy it. They’ll enjoy it for a time. ABC game. Hunt for the ABC’s in alphabetical order on road signs and license plates. License plate game. See how many state license plates you can find. Try to find all 50 states. 20 Questions. Someone picks an item that is either animal, vegetable or mineral. Then the other players have to guess it with only 20 questions. I’m going on a picnic. Another classic alphabet game where someone starts with “I’m going on a picnic and bringing (something that starts with the letter A). The next person recites the first thing and then adds something with the next letter and so forth until someone forgets one of the items on the list. With older kids, make it fun by making hard to remember words. 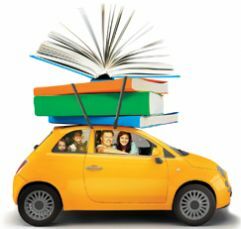 Now is your chance to teach your kids all the cool things about reading. Audio books can be a huge lifesaver if your kids are old enough. Don’t torture yourself by getting books just for them. Pick out something everyone will like. There are plenty of children’s books that adults can enjoy. Classics like Little Women or Little House on the Prairie come to mind; or delightfully devilish author Roald Dahl’s books; or fantasy adventures like the Chronicles of Narnia are all great choices and very kid friendly for 5 and up. Kids need to stretch their legs and their brains more often than adults. Plan to stop every few hours so your kids won’t go stir crazy. Car DVD players are a lifesaver when all other options have been exhausted. When the kids start bickering, pop in a movie and you’ll have a couple of hours of peace and quiet-ish. We love to drive around the kiddo’s sleep schedule. Leave early enough and your kids will take a morning nap. Leave late enough and you’ll be able to clock several hours on the road before you need to catch your own ZZZs. Kids love to take pictures. Every time you stop, point out things for them to take photos of. Once back in the car they will spend time scrolling through their own photos and taking pictures of interesting things along the road. 20. Most Important – Carry a Potty! Yep, I’m ending this post with more important info on kids’ pee habits. 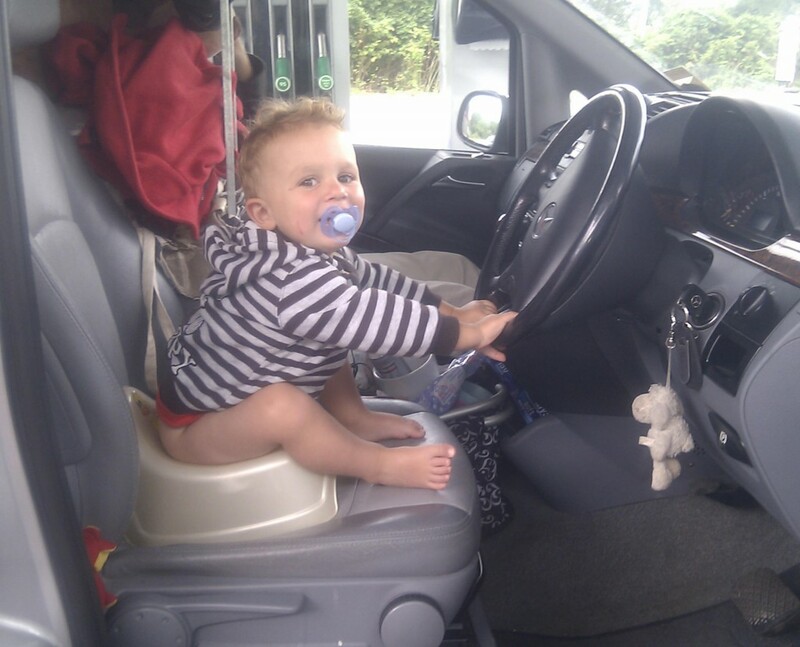 It never fails, your child will suddenly need to pee when there are no rest stops in sight. Be prepared, you never know when you’ll need to make the side of the road a pit stop. And don’t forget the TP! 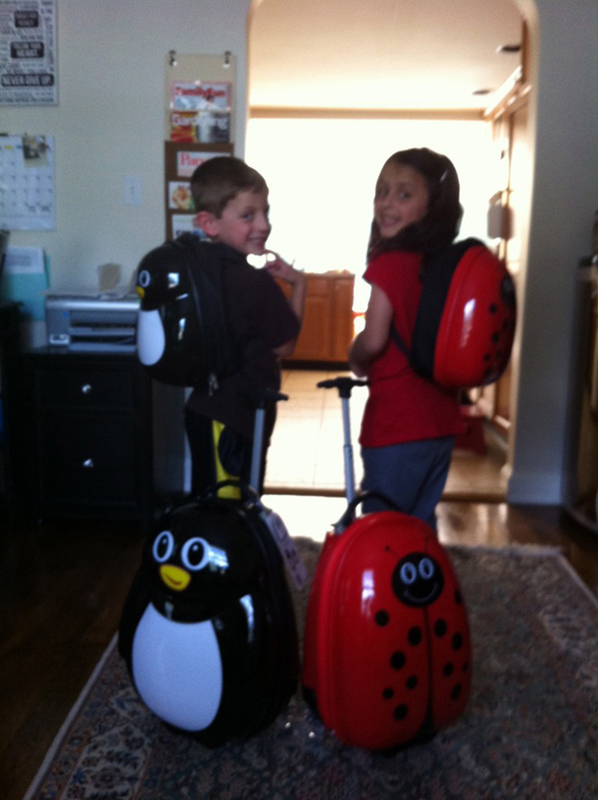 Share your Tips for Traveling with Kids with Us! If you have successfully planned vacations with stress free traveling, feel free to share your ideas with us below. There are millions of parents waiting to hear from you. 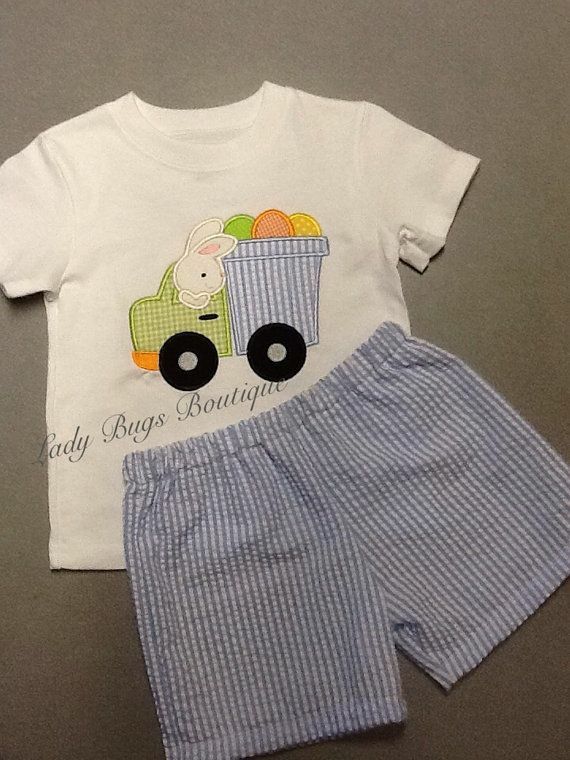 Subscribe to our mailing list for exclusive offers and discounts.